Most of the beads displayed in this section are sourced from the area around Balkh in North East Afghanistan. 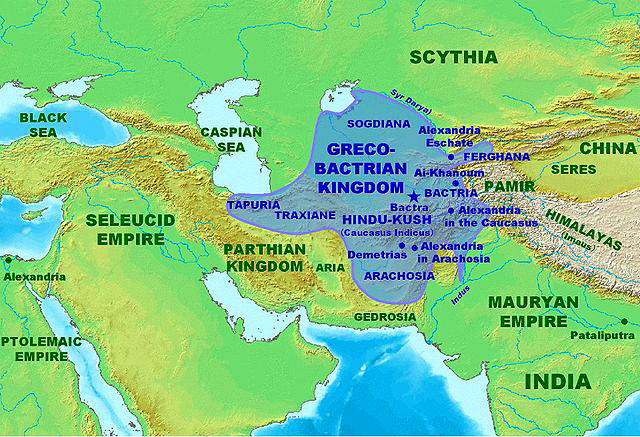 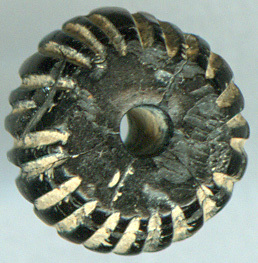 Third and second Millennium B.C. 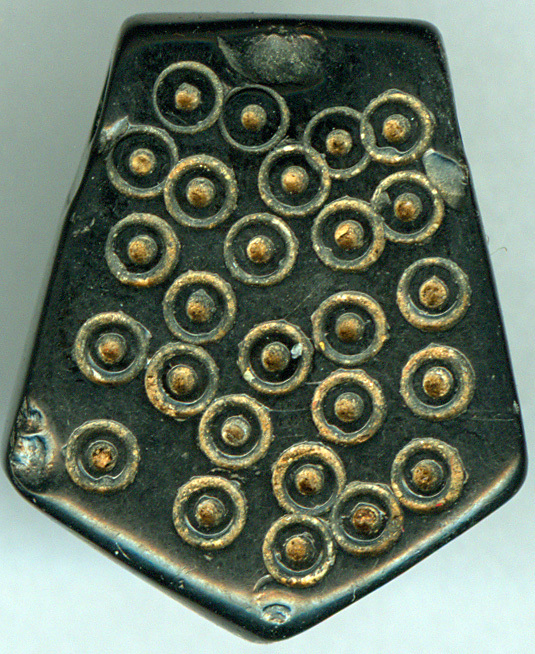 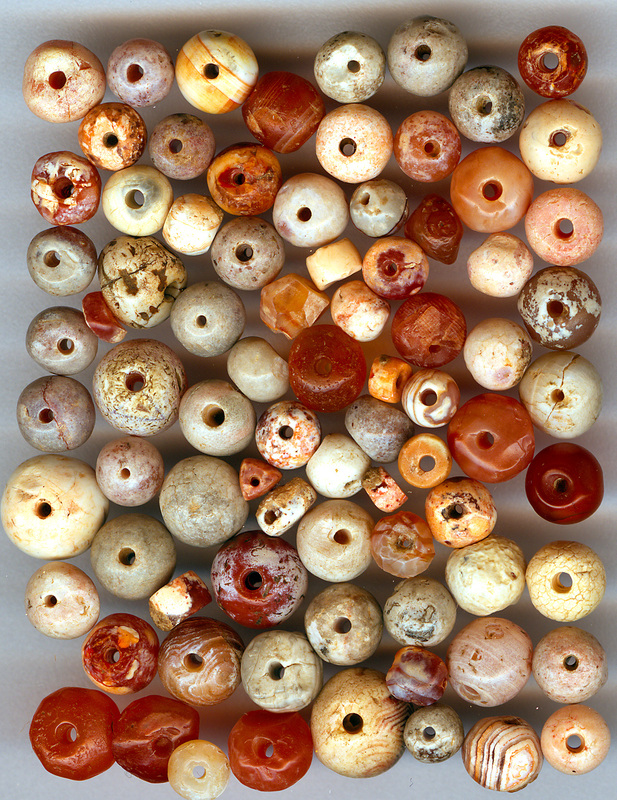 The remarkable and rare amulet beads shown below all have dot-in-circles designs, most probably made by a kind of hollow drill instrument. 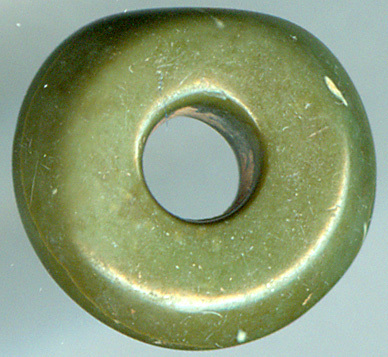 These circles depict an archetypical symbol found in many cultures without any cultural interaction. 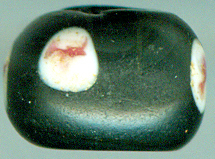 They are the blessing eyes, protecting the wearer from evil eyes and intentions. 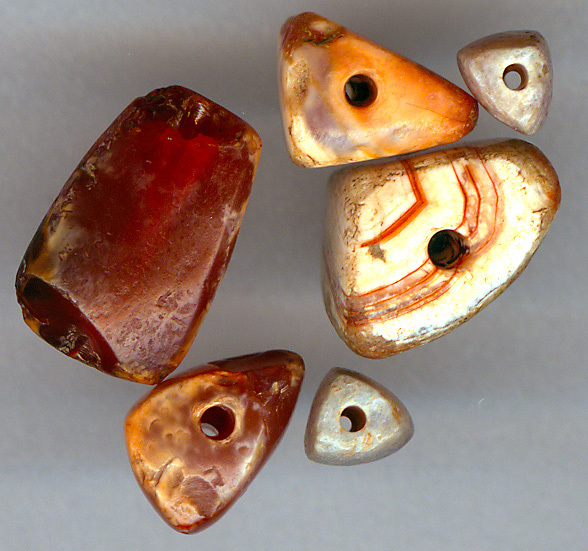 It is strange that the eyes, very precise themselves and made on careful symmetric designed beads seemingly are put almost random on the surface of the bead. 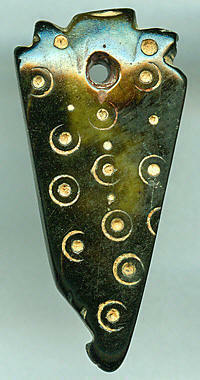 It made me take up the hypothesis that the eyes also could depict constellations of stars. 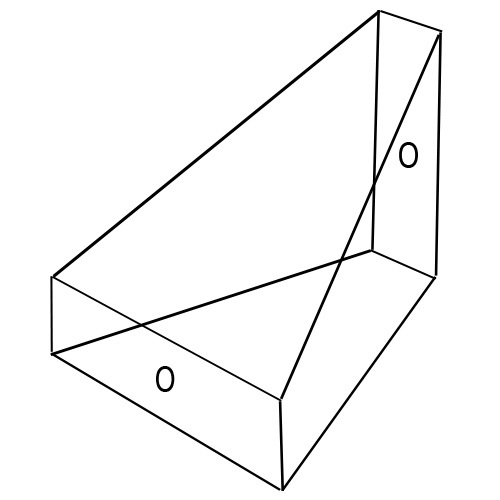 This hypothesis is however difficult to back up by evidence. 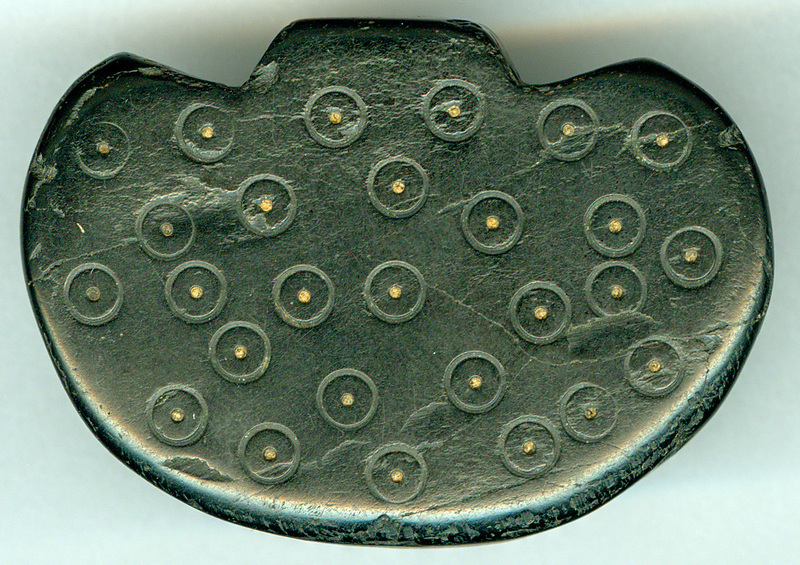 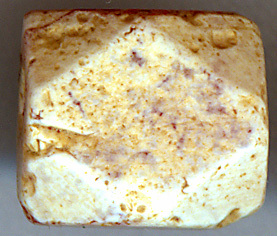 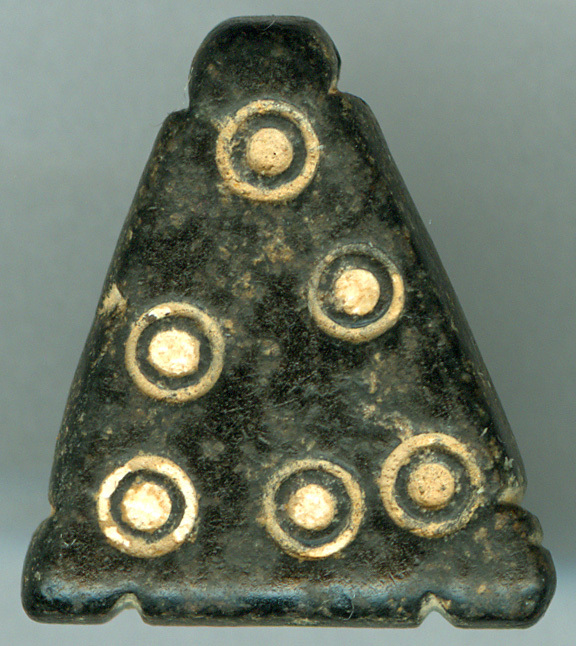 It seems that the patterns made by the dots have no resemblance to star constellations as they were in North East Afghanistan in the third millennium BC. 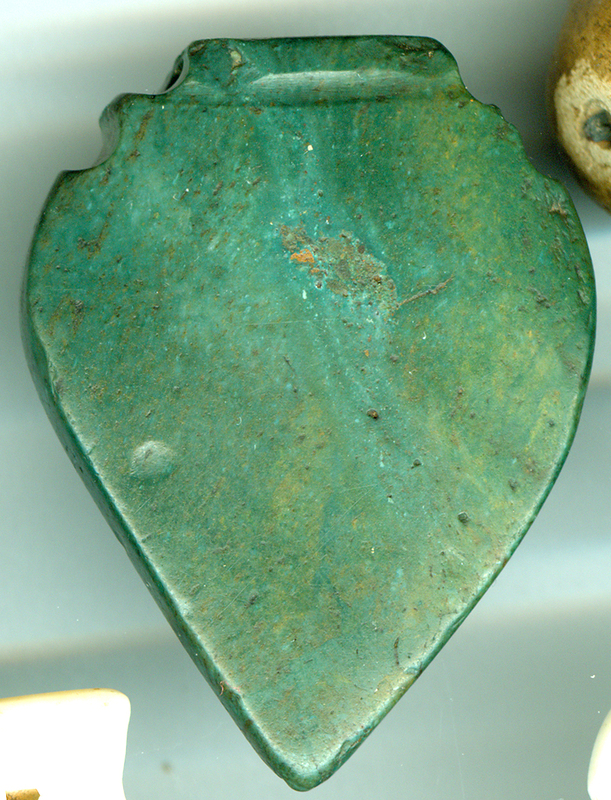 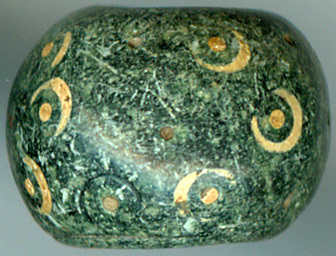 The amulet beads above are made of black stone with clouds of green. 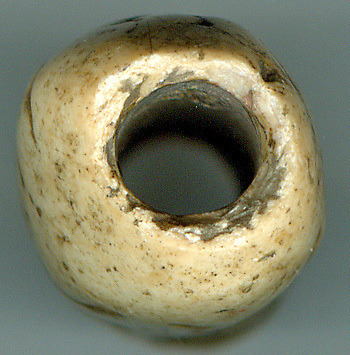 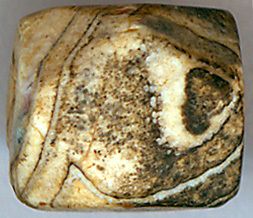 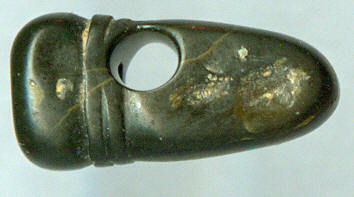 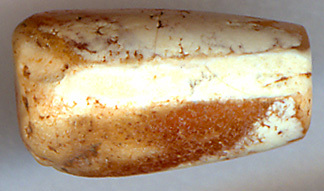 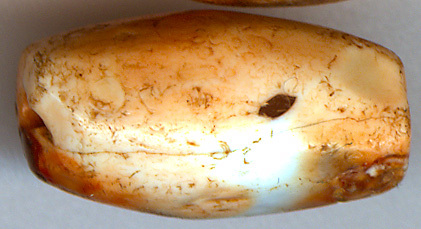 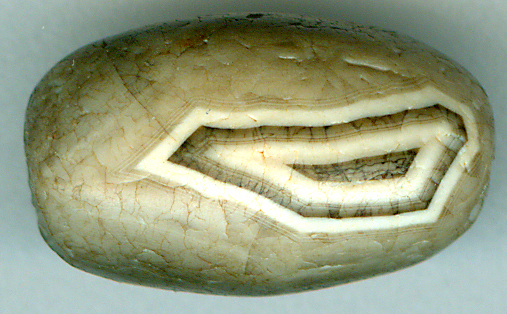 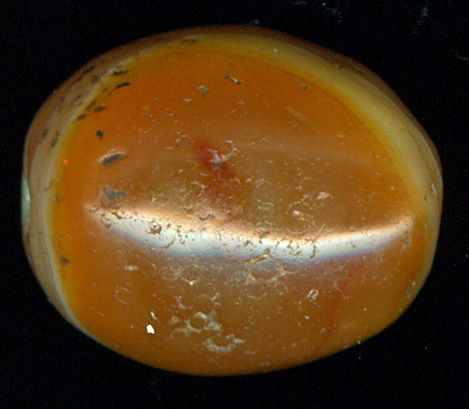 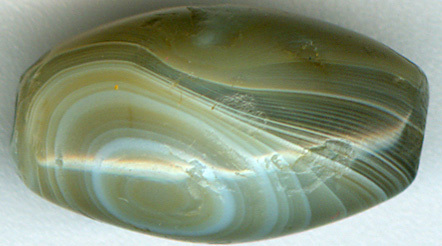 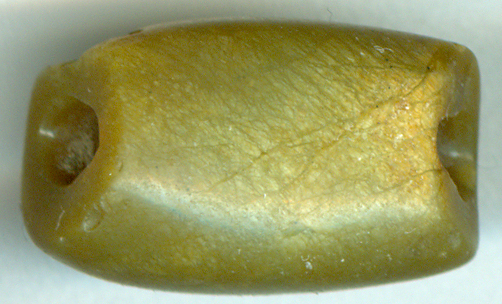 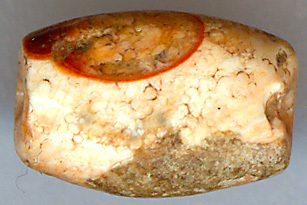 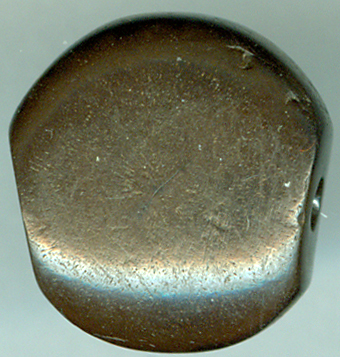 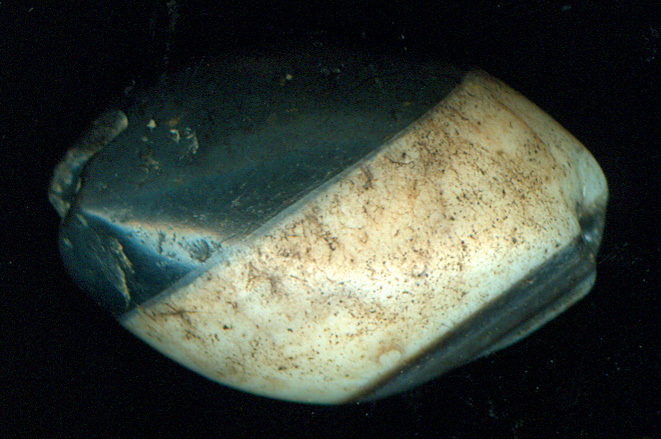 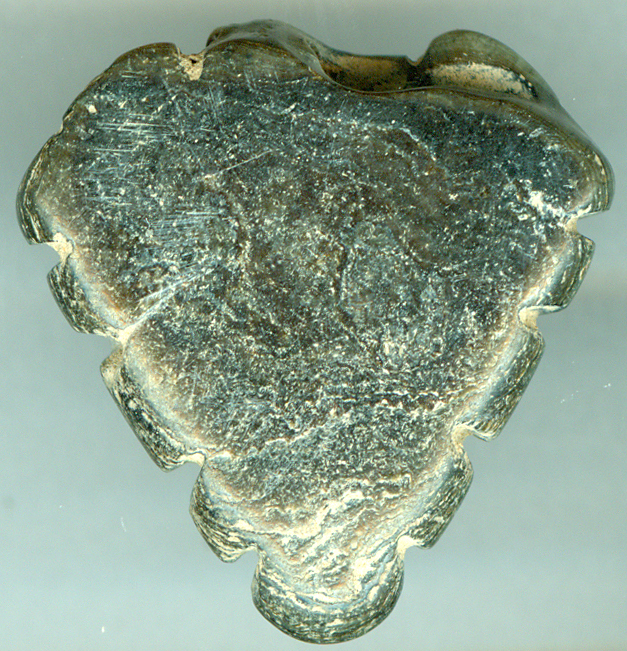 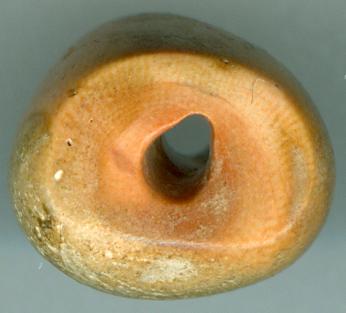 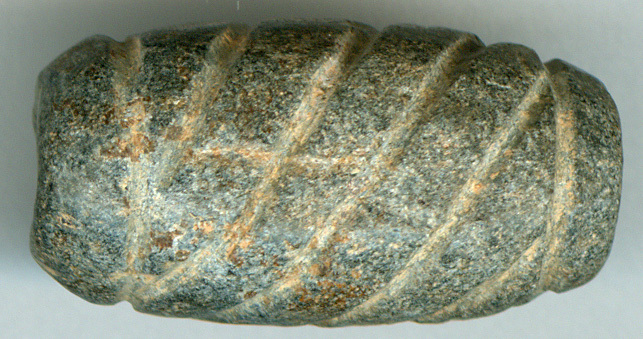 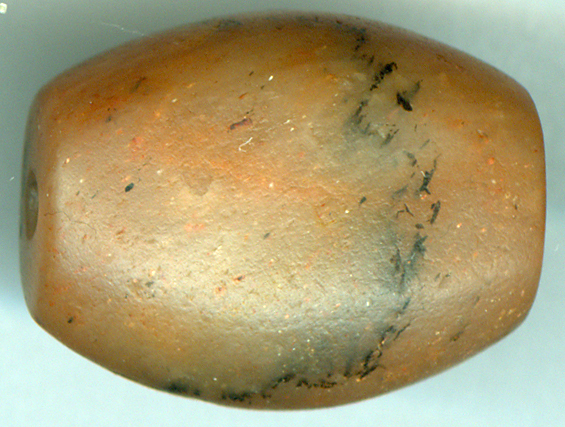 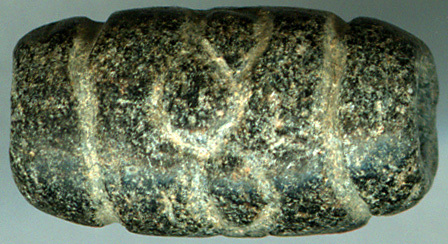 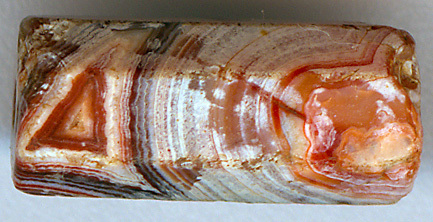 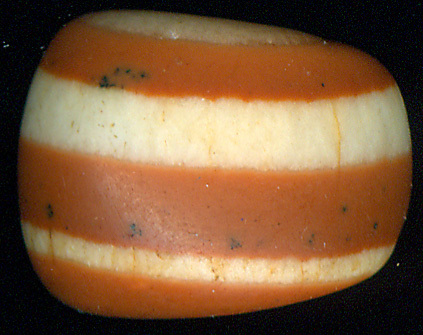 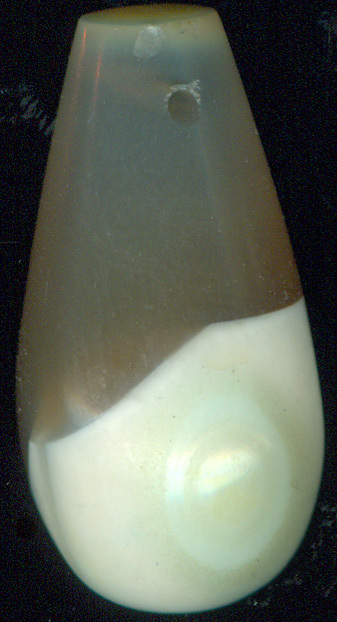 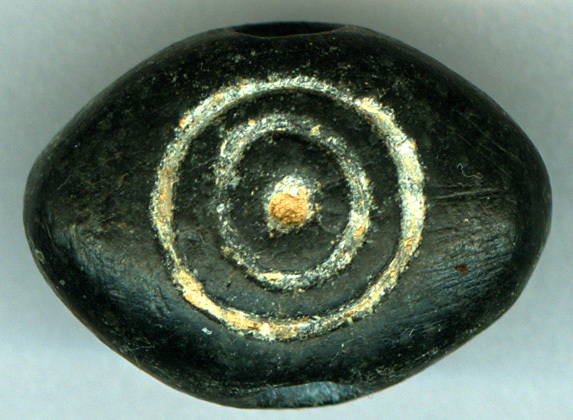 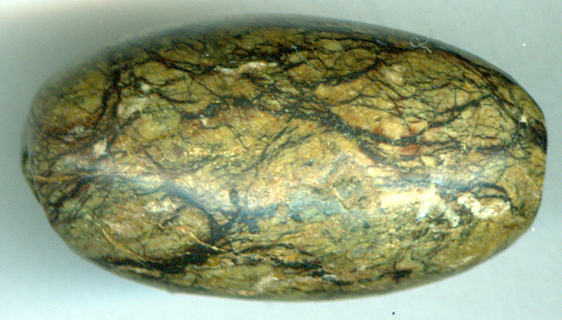 Eye bead made of schist. 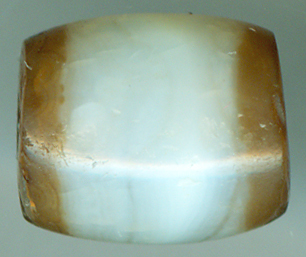 resembling the white part of the eye. 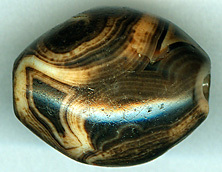 This makes the bead both calm and dynamic. 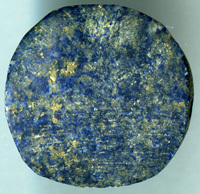 Afghanistan has since Neolithic stone bead times been famous for Lapis Lazuli. 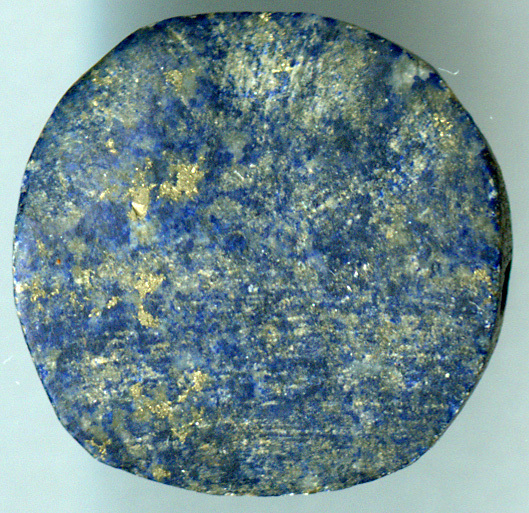 Lapis lazuli had in the third millennium BC the same value as gold and precious stones. 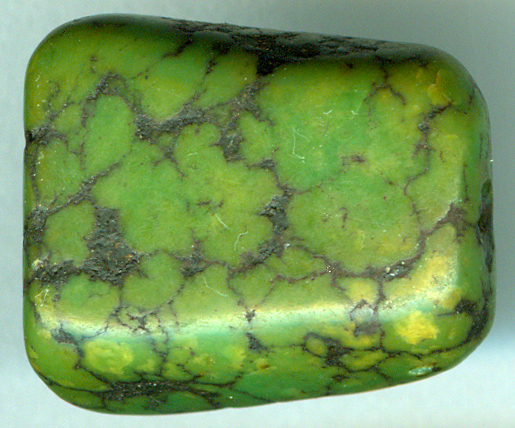 It was mostly mined from North East Afghanistan, Sar I Sang, and exported from there as far as to Syria. See more Lapis Lazuli beads from Afghanistan under various Ancient Beads. 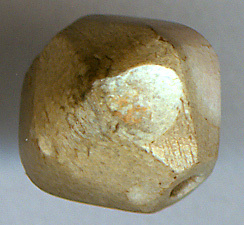 round on the side displayed. 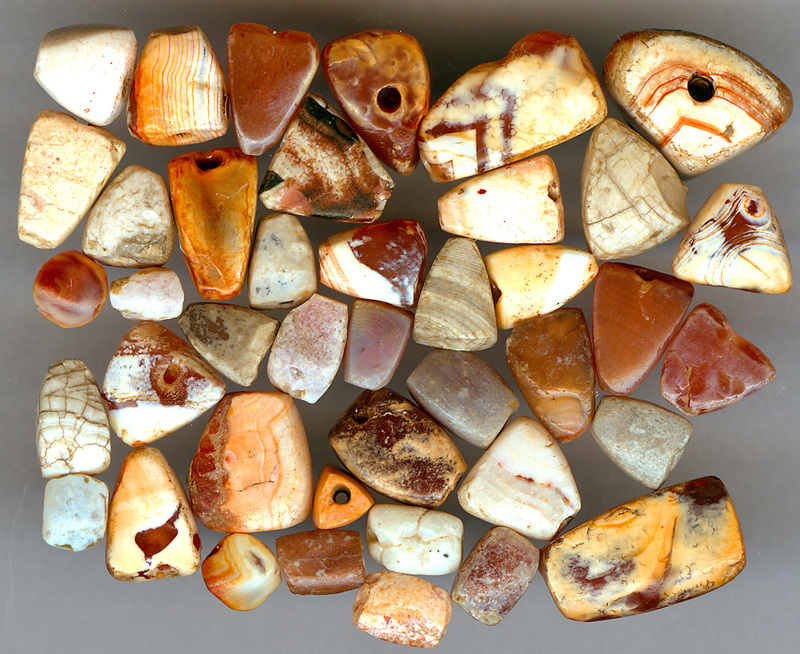 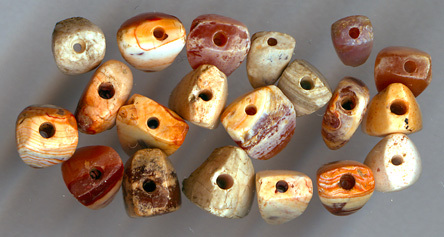 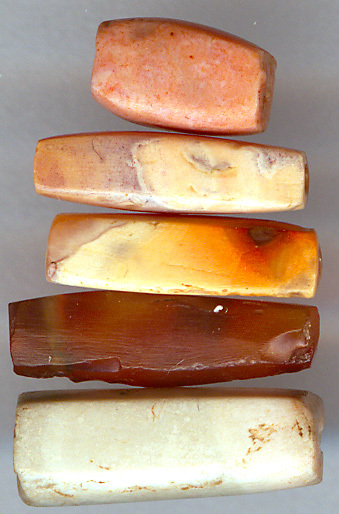 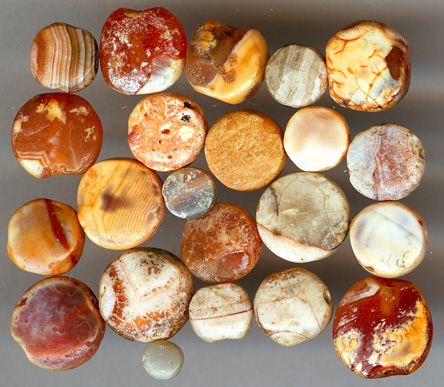 These beads are made from a fossilized jasper from India. The locals call this stone, Mahamiriam. 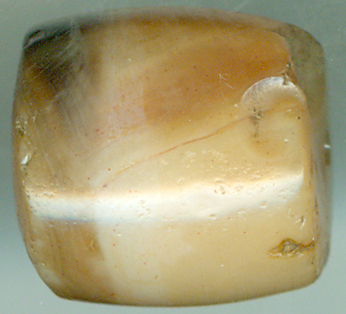 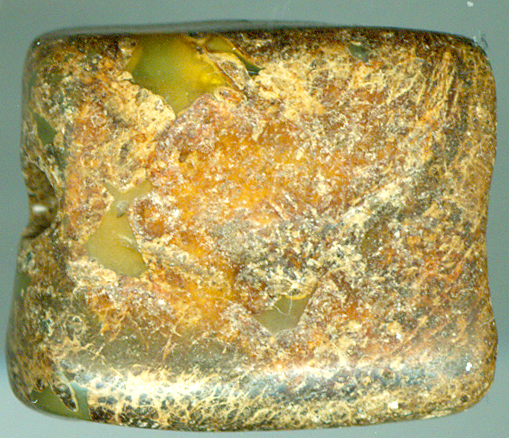 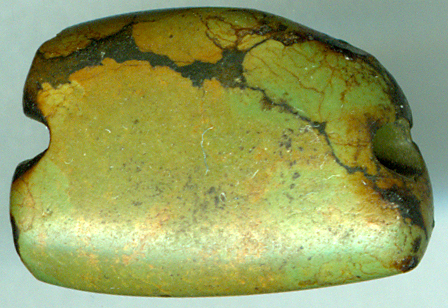 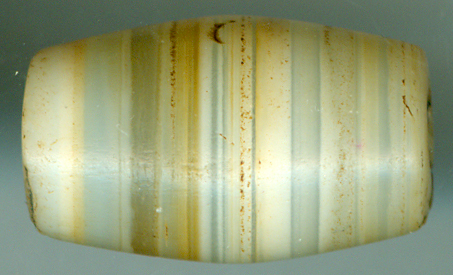 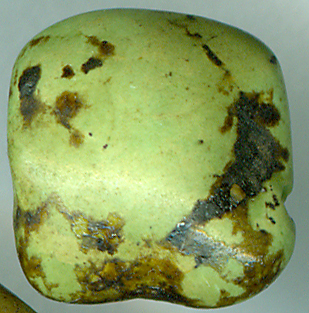 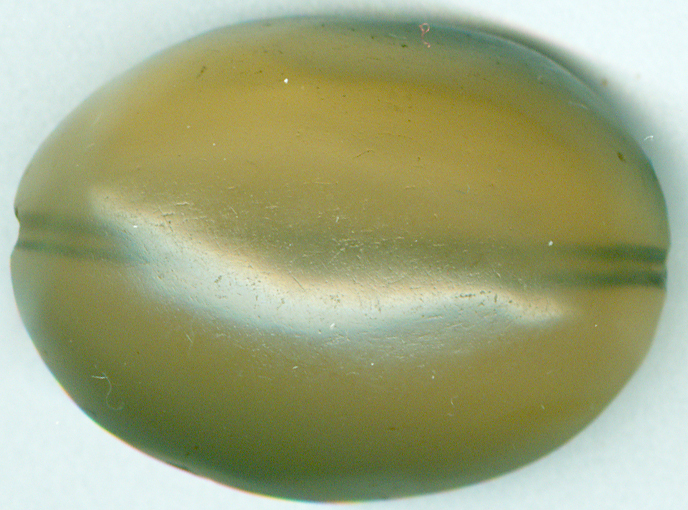 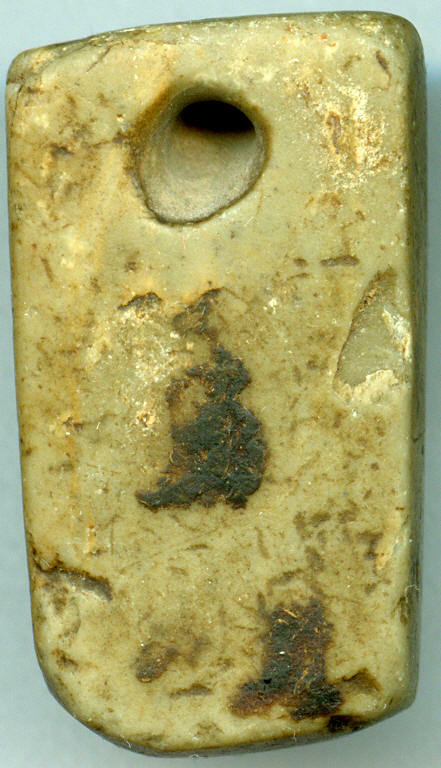 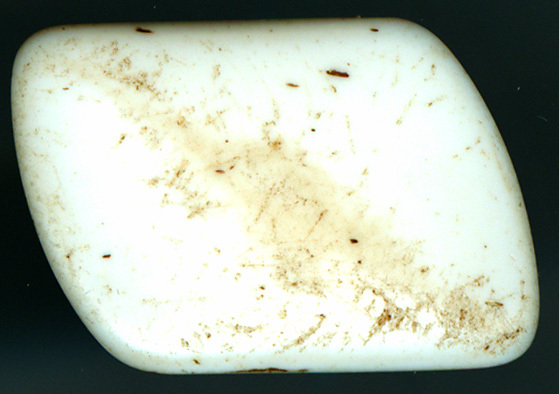 It is also known as Elephant Jasper. 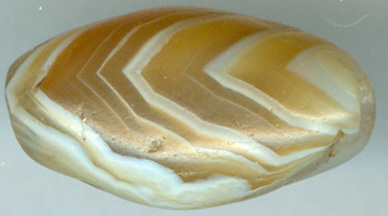 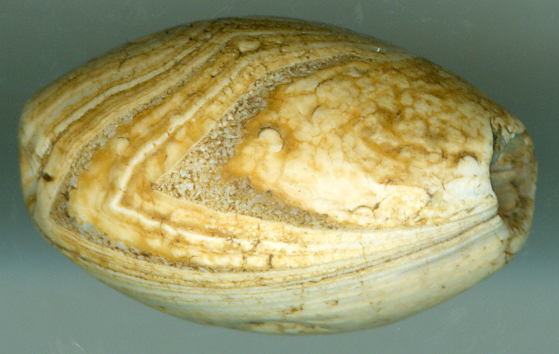 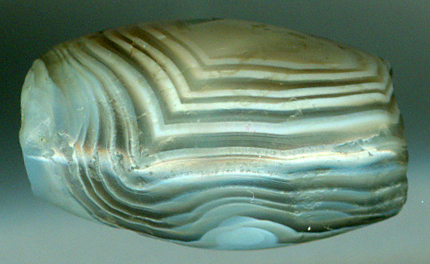 This fossil consists of coquina clams mixed with sand and has formed near the seashore of Gujarat. 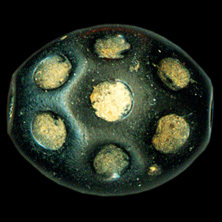 Below you will see some wonderful burial beads from the Greek Kingdom of Bactria. 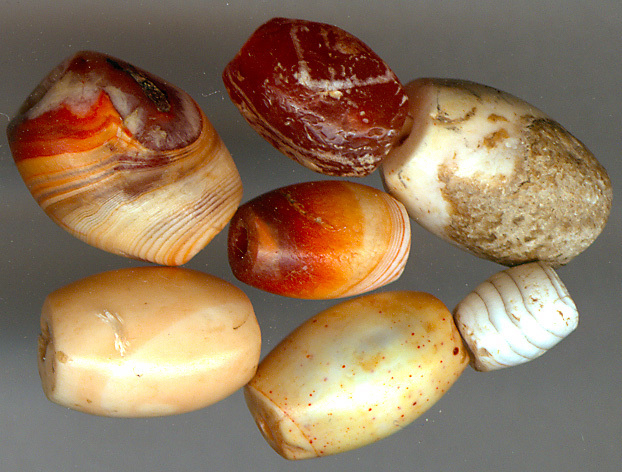 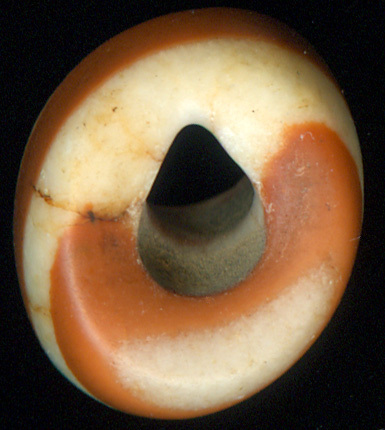 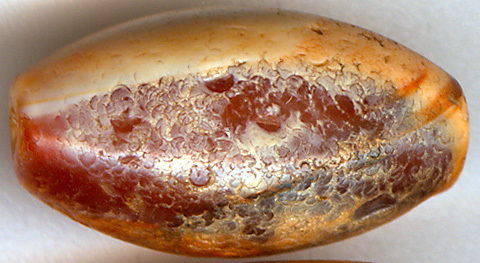 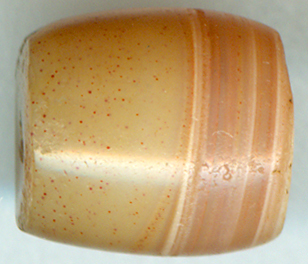 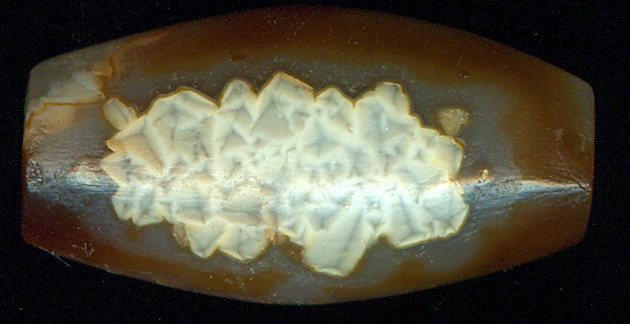 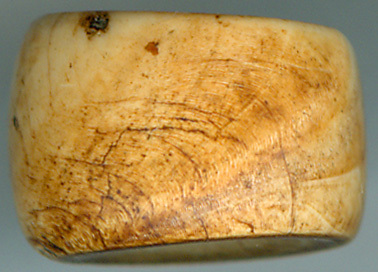 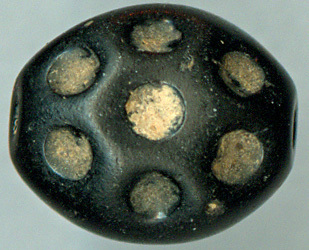 The beads are discolored by sleeping in the earth for a thousand winters and summers. 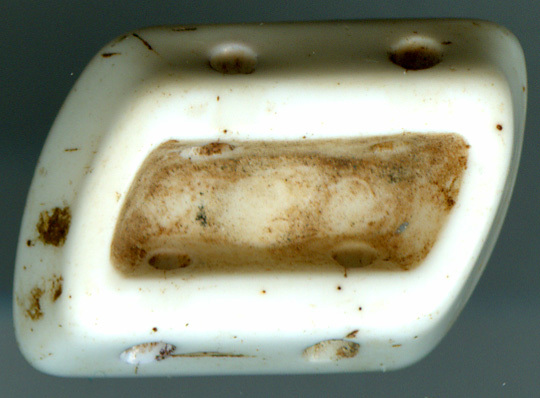 However they also bear clear marks from human wear and tear. In short: the fulfill all the criteria's of being sublime scarred beads. 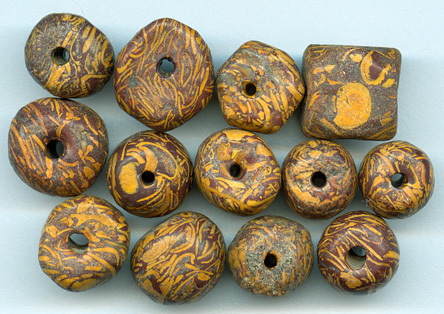 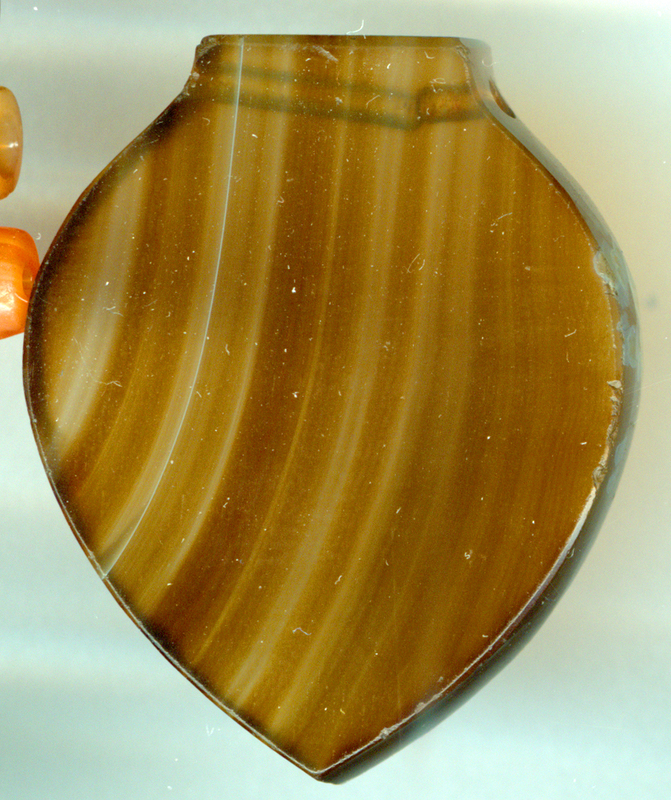 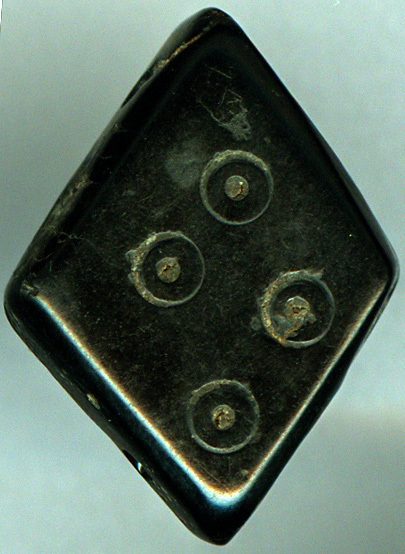 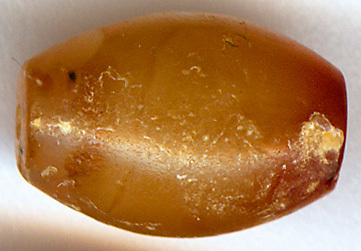 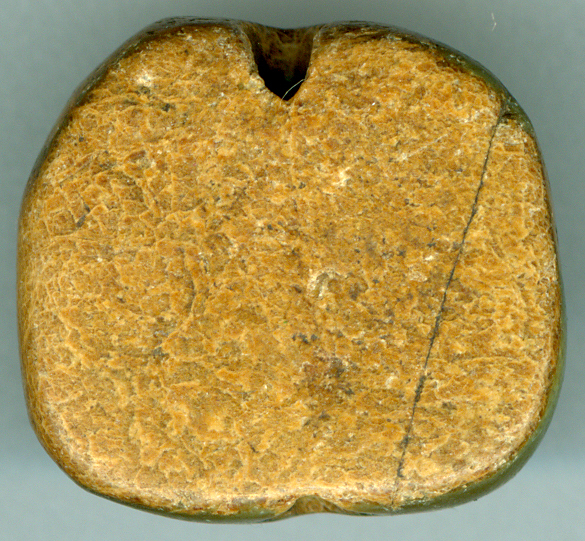 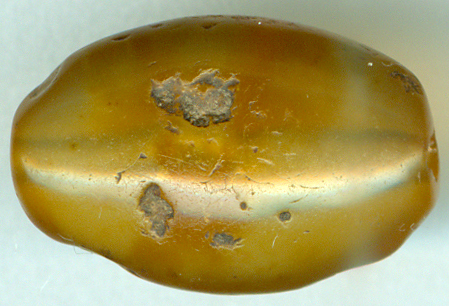 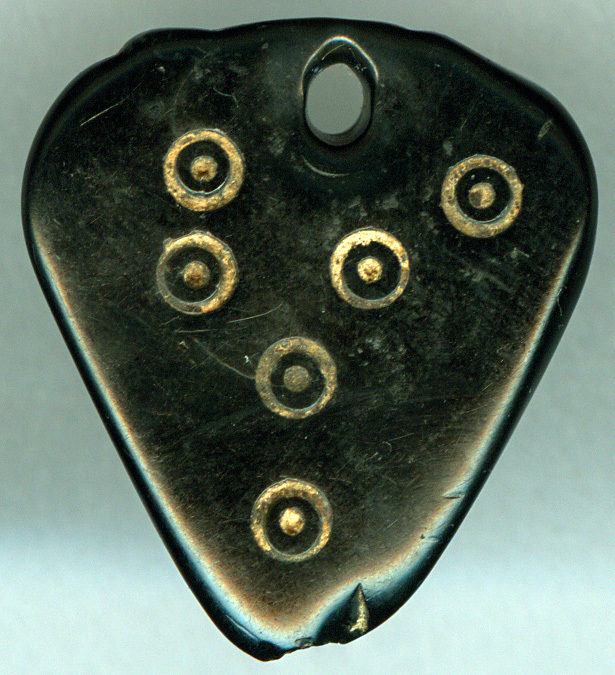 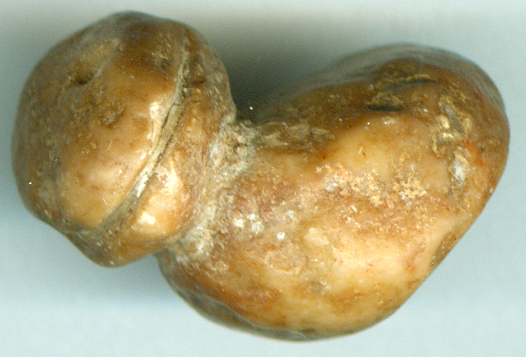 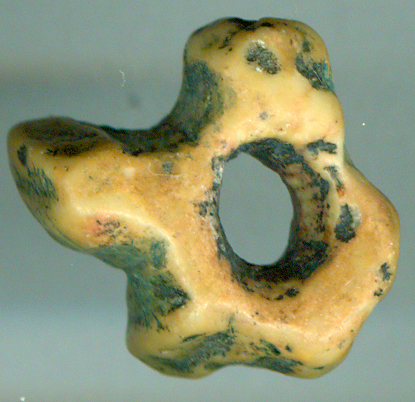 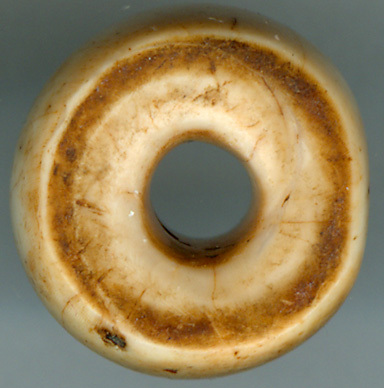 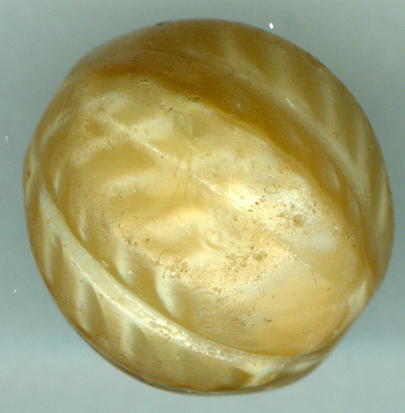 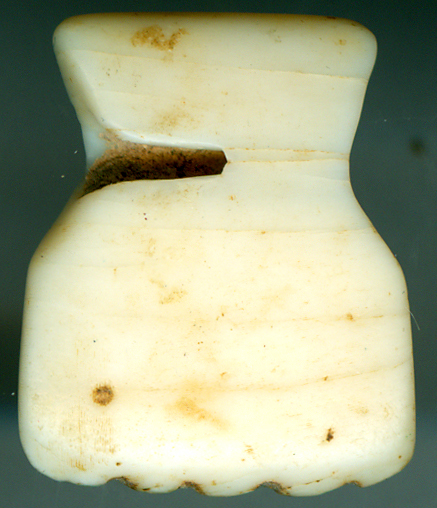 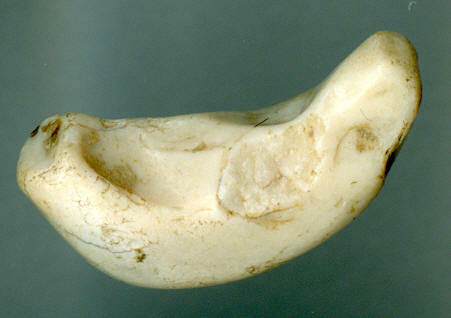 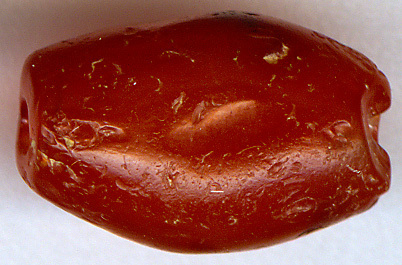 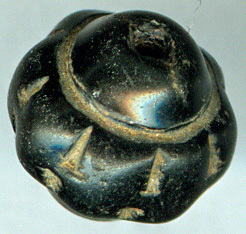 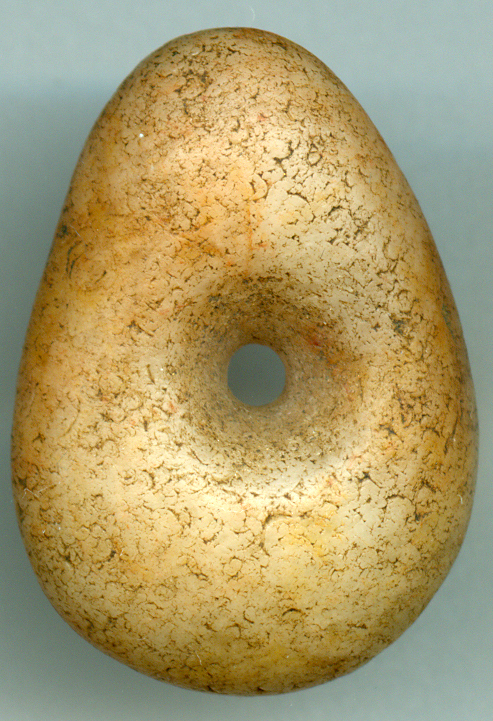 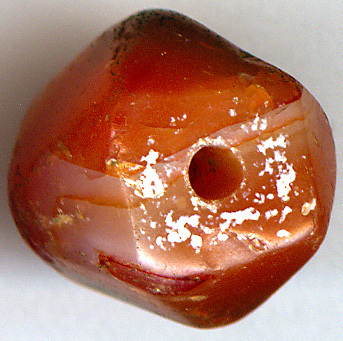 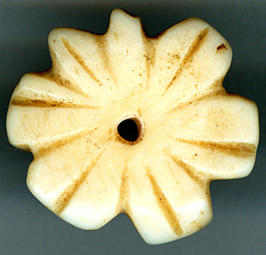 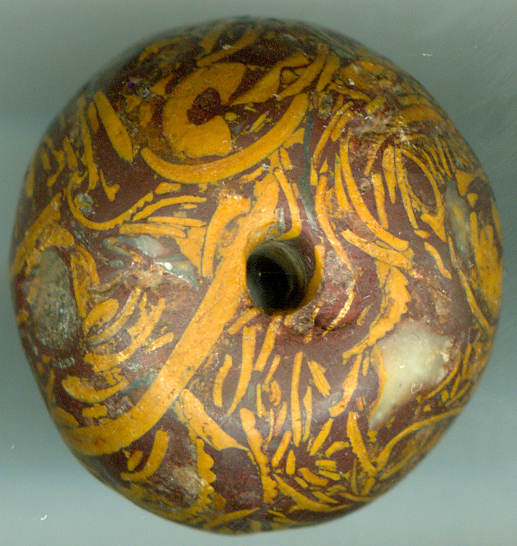 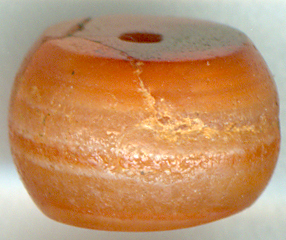 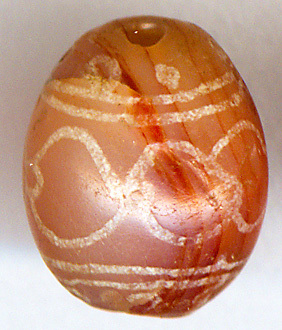 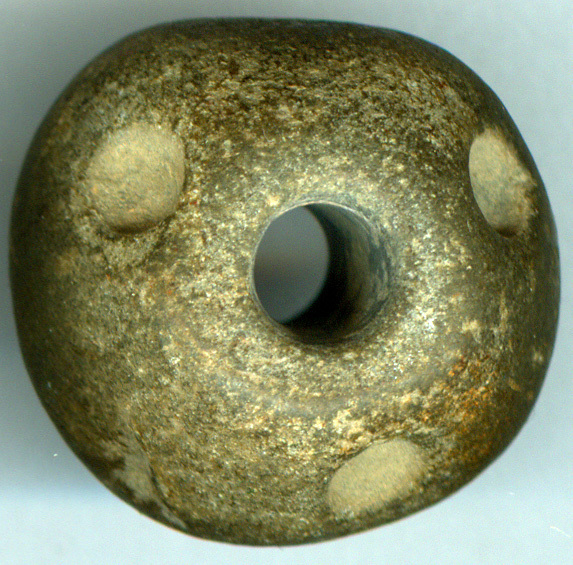 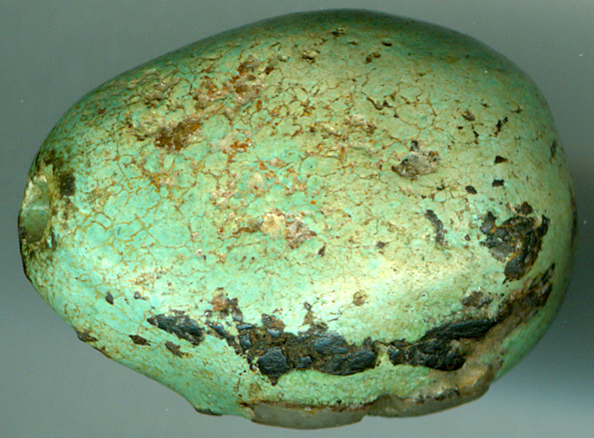 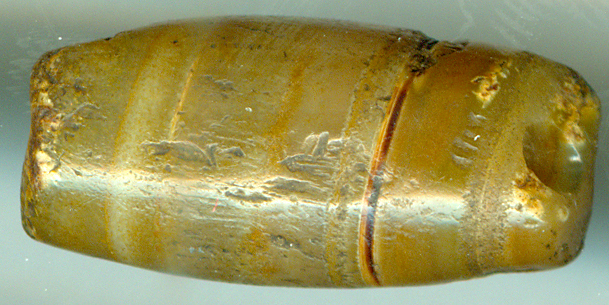 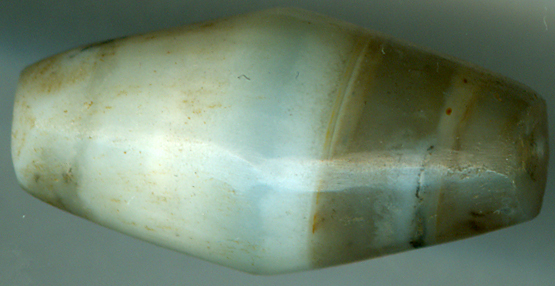 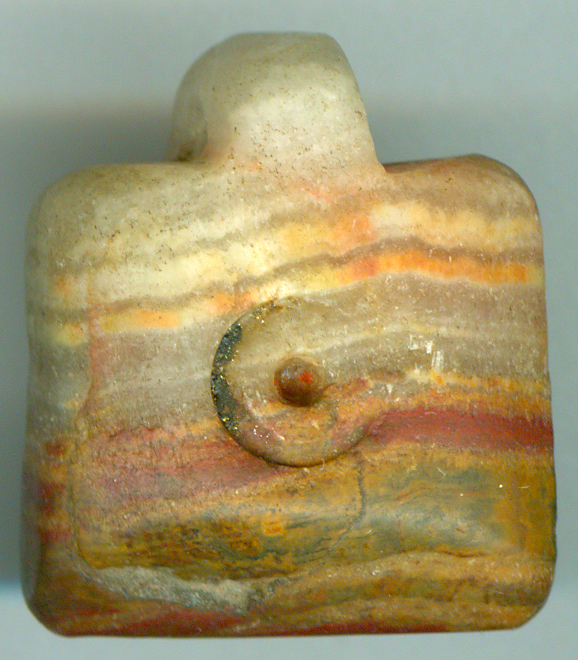 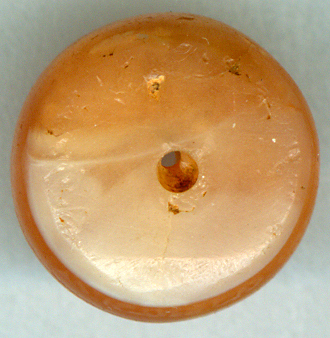 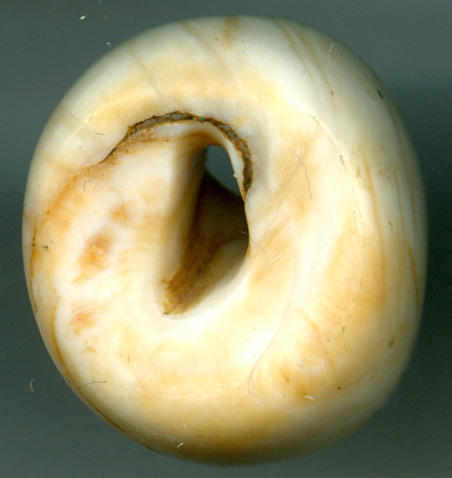 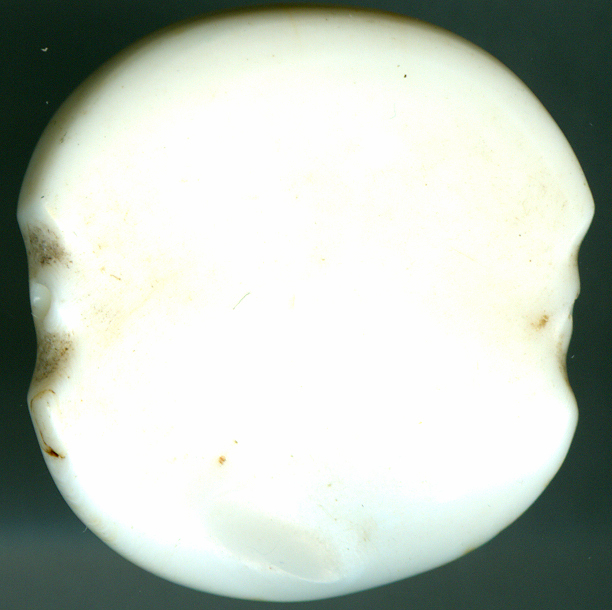 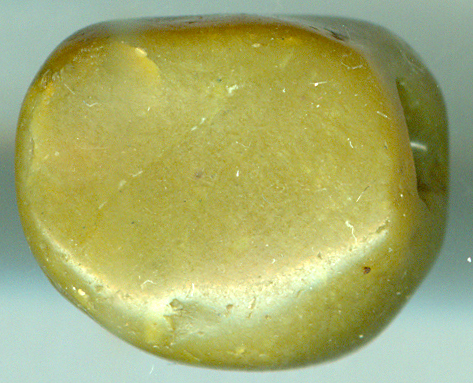 The Bactrian beads displayed above have a very unusual form. 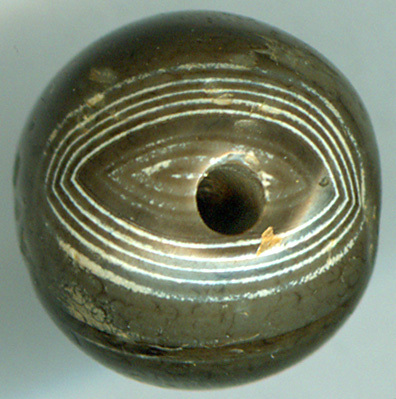 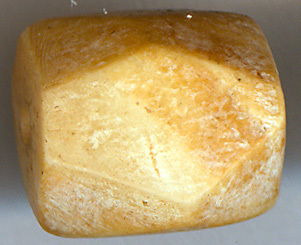 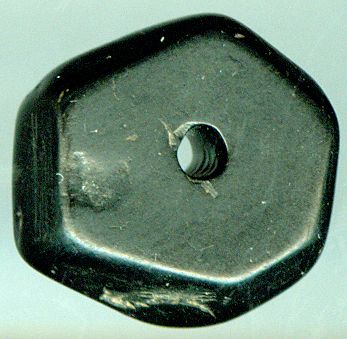 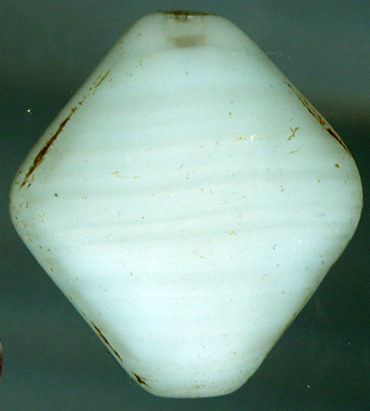 This shape, as displayed below is not to my knowledge not mentioned in any bead book. 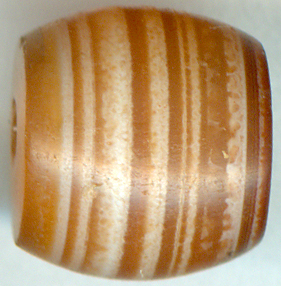 These beads are rare.